In our concept, the deliverables could generate enough profits to let it withstand and therefore would not depend on government subsidies. The state of art is not economically advisable without fully utilize the deliverables, i.e. biogas from landfills. Biogas electrification is just low base-load and is far higher than hydro-, wind- and nuclear if we consider the renewable energy perspective. So, biogas should be regarded as a valuable intermediate for higher added value rather than directly using in subsidized competition to natural gas. Guo – Business Development has been strategically teaming up with IuT group (Austria), BioEnergy 2020+ (Austria) and Technical University of Vienna (Austria) to achieve our goal - a sustainable green community development by contributing our core competence. We share the same vision to create a green economy by reducing greenhouse gases and pollutant emissions by improving the total energy efficiency and the use of renewable energy. 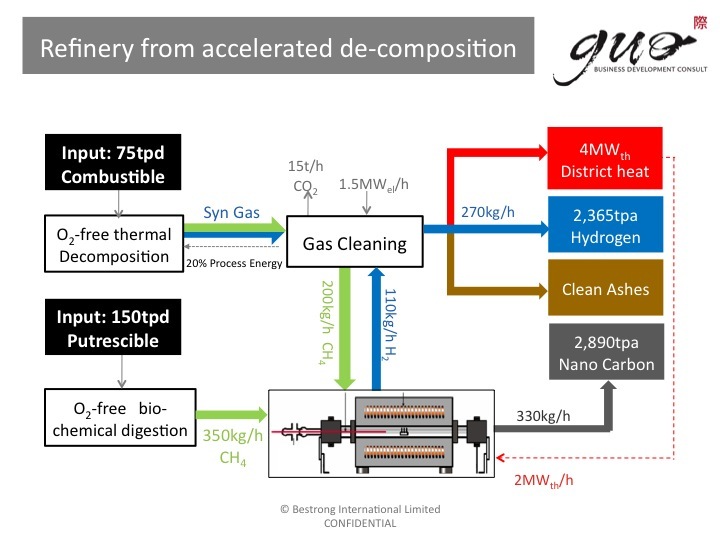 Our proprietary concept could be the first concept to turn Waste into Energy and then into a Hydrogen Economy since we believe our concept could generate enough economic value so that it could be self-sustainable without the subsidy or protection policy from government to realize the concept of biomass/organics/waste utilization.